When the words "tech" and "apparel" come together, some cockamamie things can often result. But this Manfrotto Pro Field Jacket is different. It doesn't make the wearer look like a cyborg wannabe, nor does it use brash or obnoxious "hipster chic" bright colors. 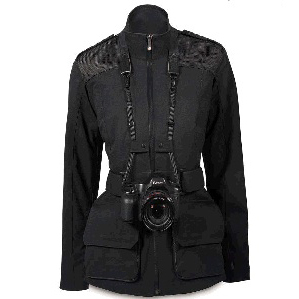 This item, designed for DSLR-slinging ladies, is a garment that actually puts the woman before the device. Any gal who's slung a heavy tote or go-bag knows how awful it is to deal with a strap that digs into those delicate shoulders. The form-fitting Pro Field deals with that via shoulder pads — yes, shoulder pads — that relieve and soften the weight without making her look like a "Dynasty" reject. Straps and tabs fasten the camera straps to her person, to prevent any flopping about. And there aren't just pockets, but modular compartments that seat snugly inside larger pockets, to hold up to two different lenses. The coolest thing is the attention to detail: The jacket even features a Micro-Fiber lens and screen cleaning fabric sewn right in, tucked into the sleeve's interior. Now that's smart thinking. I've seen many female journalists don field jackets designed for men, just for the sheer practicality of the garments. But this one's pretty refreshing, as it seems to offer all the necessary functionality, but none of the frivolous and "precious" stylings often reserved for female-oriented tech accessories. This is utilitarian wear geared for real women who want to get serious business done. If you or someone you know would can appreciate a stylish, but super functional garment like this, take note: The $349 Manfrotto Pro Field Jacket sells with a $100 mail-in rebate until July 31st. RAMSEY, N.J., May 2012 — Manfrotto Distribution, world leader in the equipment and accessories industry for imaging, announced the Lino Apparel Collection women's line today. This is the first line designed specifically for women, tailored to comfortably fit without compromising style. The line includes four items that are specially designed for the female shape: Pro Field Jacket, Pro Photo Vest, Pro Soft Shell Jacket and Pro Air Jacket. "We are excited to debut a brand new line of Lino apparel that is specially designed for women in both form and function," said Kayla Murata, Product Manager Manfrotto Bags and Apparel. "Each piece allows for active movement and flexibility under various working conditions in the field. The entire collection is made from high quality materials and is designed to last for years." PRO FIELD JACKET – $349.00 The Pro Field Jacket features photographic working tools combined with comfort, convertibility, and a sleek design. It offers a classic style and comfortably holds camera gear and accessories. PRO SOFT SHELL JACKET -$169.00 The Pro Soft Shell Jacket is a warm and stylish shooting jacket designed to protect from cold while accommodating the functionality needed for day to day shooting. PRO AIR JACKET -$159.00 The Pro Air Jacket is a breathable wind and waterproof jacket that folds into its own integrated compact pouch. PRO PONCHO – $149.99 The Pro Poncho is a wind and waterproof poncho designed to protect the photographer and her gear from any weather conditions. Unisex, 1 size For more information, visit www.manfrotto.us. About Manfrotto Distribution Manfrotto Distribution, Inc. is a leading distributor of key accessories brands for the photographic, video, cine and lighting production markets. Manfrotto Distribution is an international company within the Imaging Division of the Vitec Group, which owns the following leading international brands: Manfrotto, Gitzo, Kata, Avenger and Lastolite. As the U.S. distributor of National Geographic, Metz, Gossen, Elinchrom, Genus and Rotatrim, which are available nationwide through an extensive network of authorized dealers, Manfrotto Distribution offers the most complete range of exceptional camera and lighting accessories in the business. The Manfrotto Distribution international network covers the U.S., Germany, France, Italy, U.K., Hong Kong, China and Japan. www.manfrottodistribution.us.